Mrs Binta Nyako, the judge presiding over the trial of the leader of Indigenous People of Biafra, Nnamdi Kanu has rebuffed claims by the IPOB leader's lawyer that the military are in possession of his client who has been missing after a bloody raid at his residence in Umuahia last month. Nnamdi Kanu's lawyer, Barr. 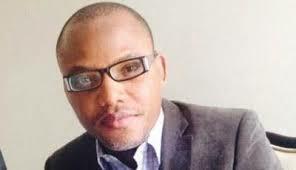 Ifeanyi Ejiofor had during the proceedings disclosed reasons behind his client's absence in court, in response to the question tabled by the presiding judge, demanding the whereabouts of the first defendant, Mazi Nnamdi Kanu. Barr. Ejiofor narrated all the inconveniences as concern how the Nigeria Armed Forces invaded his client's house, massacred at least 28 persons and since then, his client's way about is not yet known as Nigeria Army are in a better position to provide him before the court. But while narrating the ordeal, Justice Binta Nyako angrily responded, and told Ejiofor that all the stories is none of her business, and, asked if those who stood as sureties to the first defendant are in the court. Also making progress, a lawyer representing Sen. Enyinnaya Abaribe stood up, telling the honorable court that his client knows nothing about the way about of Nnamdi Kanu. He therefore prayed that his client is asking for the withdrawal of his surety, of which the judge hurriedly said that she cannot listen to that plea unless Nnamdi Kanu is available with his sureties in the court. The presiding judge stated that she is going to invite the sureties and ask them why Nnamdi Kanu is not present in the court. She further said that what makes them his sureties is to give any account of his whereabouts if the need arises. Finally, the judge ordered the prison authorities to allow the third defendant's doctor to always check on him anytime, any moment. She therefore adjourned the case to 20th of November 2017 for the commencement of the trial.